Many shooters get their feet wet in competitive shooting by competing in club-level bullseye shooting matches. Most of these are NRA Bullseye matches and require a shooter use a .22 LR pistol or revolver capable of holding at least five rounds either with or absent an unmagnified optical sight. With a three-part course of fire consisting of a slow fire, timed fire and rapid fire string, speed comes second to precision. The one area that snags up many new shooters is what equipment to run. For optic sights anything that will hold zero and features a dot smaller than two minutes of angle will work fine, but what about the lead delivery system? The .22 LR pistols run the gamut in terms of price and performance but the two aren’t always linked. In other words, the most expensive pistol isn’t always the best. 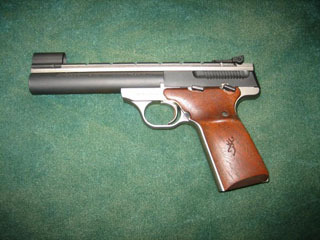 A few examples of .22 caliber guns that will help to enhance your Bullseye Shooting experience. Ruger’s get a bad rap for being one of the least expensive options for new bullseye shooters, but they offer a tremendous amount of value and flexibility. Unlike older bullseye pistols, the Mark III’s receiver is already tapped for a scope mount that is included with the handgun. Additionally, since the pistol is so ubiquitous there are hundreds of available accessories for it. The platform’s shortcomings are its somewhat limited accuracy when compared to higher-end target pistols, and its difficult disassembly procedure for the uninitiated. The MKIII has higher tolerances than every other pistol on this list and tends to function with all but the worst ammunition. The Browning Buck Mark is a fairly inexpensive way to get into bullseye shooting without holding most shooters back. It may not be as accurate as the purpose-built models from Hammerli or Walther, but it holds tight enough groups that any 10-ring misses are purely shooter error. Like every model on this list, the Buck Mark features a fixed barrel, but unlike the rest has a build-in scope rail. The newest models from Browning, dubbed URX feature an ultra-soft finger-grooved grip, which is good for camping guns, but not necessarily for target ones. The Buck Mark has been around for awhile, so finding accessories should be easy enough and the magazines are inexpensive. Designed with the same 105 degree grip as the venerable 1911, the Smith & Wesson Model 41 was built for the 1911 lover wanting to try their hand at bullseye shooting. In fact the stock trigger of a Model 41 feels like it belongs on a match-grade rifle or 1911. Just like a 1911 the Model 41 comes with a steep price tag, and rightfully so — it’s a purpose-built target pistol with ultra-tight fitting internals. 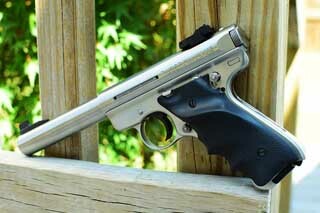 The Model 41 is more accurate than its main competitor, the Ruger MkIII, but at more than double its Price. 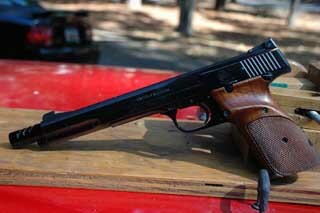 Older models are just as accurate as modern ones and often times have a better, hand-fitted trigger. So be sure to check pawn shops for 41’s that might have a scuffed exterior to save big bucks on this tack-driver.